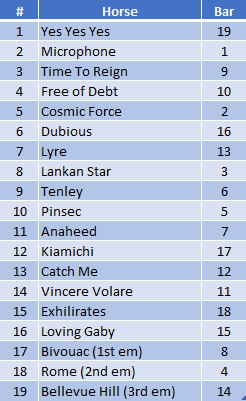 Fascinating wide open Golden Slipper, one of the corporates has four equal favourites, all at $6. Going to work with three roughies for novelty betting - Pin Sec, Anaheed and Dubious. Not sure of weather forecast but track condition will be interesting. if you bet on races like the slipper you have a snout on your dough...so many probabilities. jum, oldhendo likes this post. Exhilarates is a favorite of mine but will be hard from the draw. Settled on Tenley from Exhilarates, Loving Gaby and Cosmic Force. Damn. Frosty gets up at 33-1. A repeat of last year when the winner led on the heavy track and they didn't ever look like catching it. Good call Spinking, you summed it up best! ^^Yes good result for a battler. That's dissapointing news Spinking. Just bad luck.